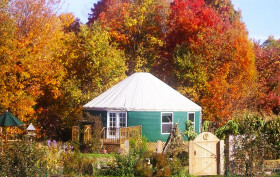 If living simpler is on your 2015 to-do list, a few days away in this delightful yurt might show you the way. Located just 12 miles south of Ithaca in Newfield, New York in a luxury glamping spot surrounded by greenery, this yurt-for-rent comes with a garden full of goldfinches and sunflowers visible from every window. Perfect for getting away from the busy city life, this Mongolian-inspired retreat offers the perfect spot for unwinding upstate.